1. Grant R. Hardy and Robert E. Parsons, “Book of Mormon Plates and Records,” in Encyclopedia of Mormonism, ed. Daniel H. Ludlow (New York, N.Y.: Macmillan, 1992), 1:195–201; Richard Lyman Bushman, “The Gold Plates as Foundational Text,” in Foundational Texts of Mormonism: Examining Major Early Sources, ed. Mark Ashurst-McGee, Robin Jensen, and Sharalyn D. Howcroft (New York, N.Y.: Oxford University Press, 2018), 13–36. 2. On the Old World historical setting for the Book of Mormon, see John W. Welch, David Rolph Seely, and Jo Ann H. Seely, eds., Glimpses of Lehi’s Jerusalem (Provo, UT: FARMS, 2004); Warren P. Aston, Lehi and Sariah in Arabia: The Old World Setting for the Book of Mormon (Bloomington, IN: Xlibris, 2015). The New World setting for the book is much less certain, but the most recent systematic attempts to situate such can be accessed in John L. Sorenson, Mormon’s Codex: An Ancient American Book (Provo, UT: Neal A. Maxwell Institute for Religious Scholarship, 2013); Brant A. Gardner, Traditions of the Fathers: The Book of Mormon as History (Salt Lake City, UT: Greg Kofford Books, 2015). 3. The 1830 edition of the Book of Mormon named Joseph Smith as the “author and proprietor” of the text. The next published edition of the book named him as the “translator.” For the significance of this, see Miriam A. Smith and John W. Welch, “Joseph Smith: ‘Author and Proprietor’,” in Reexploring the Book of Mormon: A Decade of New Research, ed. John W. Welch (Provo, UT: FARMS, 1992), 154–157; Royal Skousen, Analysis of Textual Variants of the Book of Mormon, Part One: 1 Nephi – 2 Nephi 10 (Provo, UT: FARMS, 2014), 35–36. 4. See Kent P. Jackson, “Joseph Smith and the Historicity of the Book of Mormon,” in Historicity and the Latter-day Saint Scriptures, ed. Paul Y. Hoskisson (Provo, UT: Religious Studies Center, Brigham Young University, 2001), 127–133; John W. Welch, “The Miraculous Timing of the Translation of the Book of Mormon,” in Opening the Heavens: Accounts of Divine Manifestations, 1820–1844, 2nd ed., ed. John W. Welch (Salt Lake City: Deseret Book; Provo, UT: Brigham Young University Press, 2017), 79–228; “The Gold Plates and the Translation of the Book of Mormon,” online at www.josephsmithpapers.org. For a narrative synthesis of these sources, see Saints: The Story of the Church of Jesus Christ in the Latter Days (Salt Lake City, UT: The Church of Jesus Christ of Latter-day Saints, 2018), 20–42, 54–75. 5. See “Angel Moroni,” online at history.lds.org/saints. 6. See also “History, 1838–1856, volume A-1 [23 December 1805–30 August 1834],” 5, online at www.josephsmithpapers.org. 7. See “History, 1838–1856, volume A-1 [23 December 1805–30 August 1834],”8, online at www.josephsmithpapers.org. 8. See for instance “History, 1838–1856, volume A-1 [23 December 1805–30 August 1834],” 261, online at www.josephsmithpapers.org; “Book of Mormon Translation,” online at lds.org/topics/essays; Richard E. Turley Jr., Robin S. Jensen, and Mark Ashurst-McGee, “Joseph the Seer,” Ensign, October 2015, 49–54. 9. Bushman, “The Gold Plates as Foundational Text,” 15. 10. See Richard Bushman, Joseph Smith and the Beginnings of Mormonism (Urbana, Ill.: University of Illinois Press, 1984), 187–188; Terryl Givens, By the Hand of Mormon: The American Scripture that Launched a New World Religion (New York, N.Y.: Oxford University Press, 2002), 64; The Book of Mormon: A Very Short Introduction (New York, N. Y.: Oxford University Press, 2009), 105; “Foreword,” in Sorenson, Mormon’s Codex, xiv; Paul C. Gutjahr, The Book of Mormon: A Biography (Princeton, N. J.: Princeton University Press, 2012), 61. 11. Grant Hardy, Understanding the Book of Mormon: A Reader’s Guide (New York, N.Y.: Oxford University Press, 2010), 6. 12. Anthony A. Hutchinson, “The Word of God Is Enough: The Book of Mormon as Nineteenth-Century Scripture,” in New Approaches to the Book of Mormon: Explorations in Critical Methodology, ed. Brent Lee Metcalfe (Salt Lake City, UT: Signature Books, 1993), 1–19; Robert M. Price, “Joseph Smith: Inspired Author of the Book of Mormon,” in American Apocrypha: Essays on the Book of Mormon, ed. Dan Vogel and Brent Lee Metcalfe (Salt Lake City, Utah: Signature Books, 2002), 321–366; Scott C. Dunn, “Automaticity and the Book of Mormon,” in American Apocrypha, 17–46. 13. Hutchinson, “The Word of God Is Enough,” 1. 14. Price, “Joseph Smith: Inspired Author,” 347. 15. Dunn, “Automaticity and the Book of Mormon,” in American Apocrypha, 17–46. 16. Daniel C. Peterson, “Editor's Introduction—Not So Easily Dismissed: Some Facts for Which Counterexplanations of the Book of Mormon Will Need to Account,”FARMS Review 17, no. 2 (2005): xxiv. 17. The most recent attempt to explain an inspired yet non-historical Book of Mormon comes from Ann Taves, “History and the Claims of Revelation: Joseph Smith and the Materialization of the Golden Plates,” Numen: International Review for the History of Religions 61, no. 2–3 (2014): 182–207; reprinted in The Expanded Canon: Perspectives on Mormonism and Sacred Texts (Salt Lake City, UT: Greg Kofford Books, 2018), 93–119; Revelatory Events: Three Case Studies in the Emergence of New Spiritual Paths (Princeton, N.J.: Princeton University Press, 2016); Revelatory Events: Three Case Studies for the Emergence of New Spiritual Paths (Princeton, N.J.: Princeton University Press, 2016), 50–65. Taves, a non-Mormon professor of religious studies, makes a good-faith and charitable attempt to read the Book of Mormon as inspired nineteenth century fiction and scripture. Her arguments, however, essentially amount to making Joseph Smith into a pious fraud, as she hypothesizes that Joseph fabricated a set of plates as a sort of artifactual/religious placebo to “materialize” what were otherwise intangible visionary experiences. While this hypothesis may be earnest in its attempts to bridge the divide on Book of Mormon authenticity, it ultimately fails for the same reasons as other iterations of the theory. See further the comments in Kevin Christensen, “Playing to an Audience: A Review of Revelatory Events,” Interpreter: A Journal of Mormon Scripture 28 (2018): 65–114. 18. Jeffrey R. Holland, Christ and the New Covenant: The Messianic Message of the Book of Mormon (Salt Lake City, UT: Deseret Book, 1997), 4. 19. “The Church stand[s] or fall[s] with the truthfulness of the Book of Mormon. The enemies of the Church understand this clearly. This is why they go to such great lengths to try and disprove the Book of Mormon, for if it can be discredited, the Prophet Joseph Smith goes with it. So does our claim to priesthood keys, and revelation, and the restored Church. But in like manner, if the Book of Mormon is true . . . then one must accept the claims of the Restoration and all that accompanies it.” Ezra Taft Benson, A Witness and a Warning (Salt Lake City, Utah: Deseret Book, 1988), 18–19. “One has to take a do-or-die stand regarding the restoration of the gospel of Jesus Christ and the divine origins of the Book of Mormon. Reason and righteousness require it. 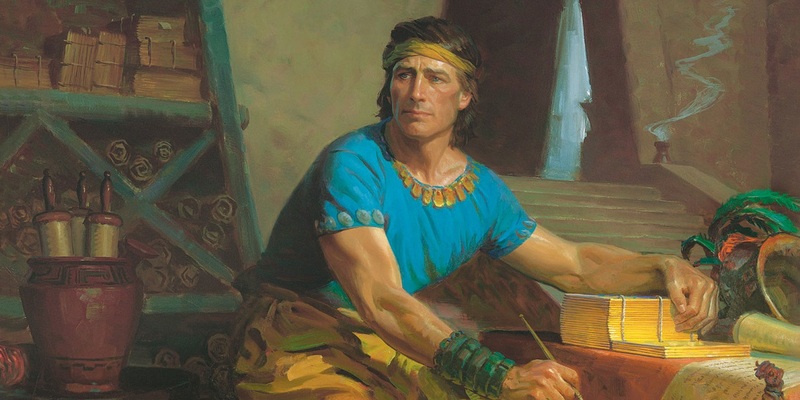 Joseph Smith must be accepted either as a prophet of God or else as a charlatan of the first order, but no one should tolerate any ludicrous, even laughable middle ground about the wonderful contours of a young boy’s imagination or his remarkable facility for turning a literary phrase. That is an unacceptable position to take––morally, literarily, historically, or theologically.” Holland, Christ and the New Covenant, 345–46. 20. See “Minutes and Discourse, 21 April 1834,” 44, online at www.josephsmithpapers.org, spelling standardized.